It’s 36 hours before the opening of the In/Future Festival and Rui Pimenta’s mind is more on matters electrical than esthetic. 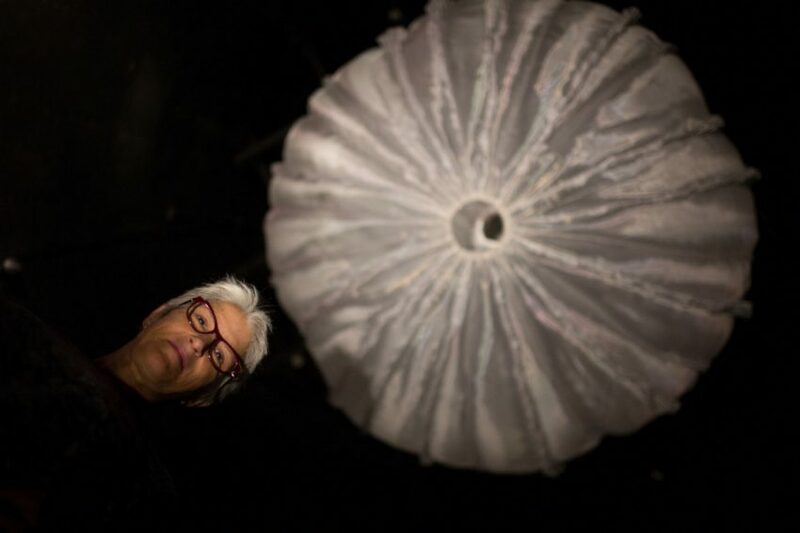 As Pimenta, who with partner Layne Hinton conceived the 10-day arts festival/nostalgia trip through our city’s recent past, wings past a decahedral concrete pavilion in a golf cart driven by an Ontario Place staff electrician, the future is no longer high-concept dreaming. The future is now and it needs its lights on, stat. In/Future is far from exceptional in its last-minute preparations, but it carries particular freight: the festival, which opens Thursday, unlocks Ontario Place to the public for the first time in four and a half years with dozens of art installations scattered across its 14 acres. Should you doubt the significance that the Ontario government, which administers the disused site through a public corporation, places on the venture, think again: In/Future will be inaugurated Thursday afternoon by none other than Toronto Mayor John Tory who, in 2012 as a provincial MPP, was assigned the task of imagining a future for the freshly shuttered amusement park. Tory’s scheme, of mixed-use residential/commercial development and public park space, hasn’t been adopted — yet — and the now obsolete future-world vision has been mothballed ever since. This week, the lights come back on, for a brief period, to offer a glimpse of what was and could yet be. 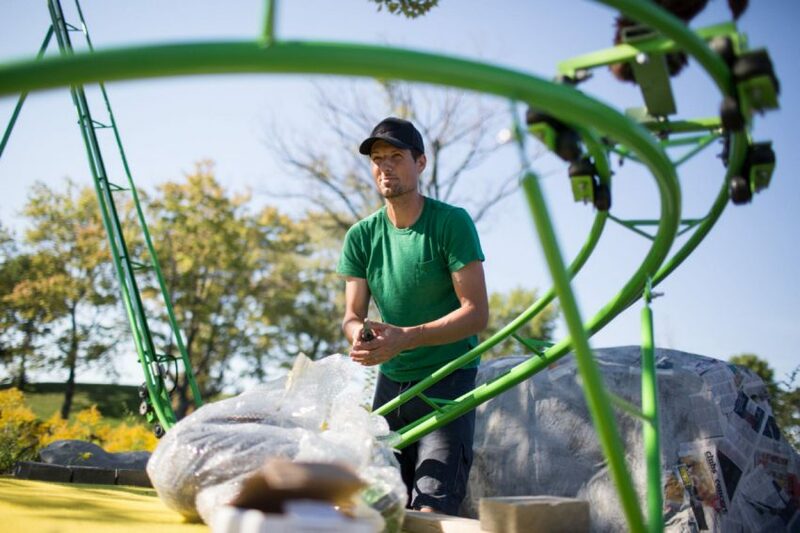 Dean, a Governor General’s Award-winning artist and a long-time fixture on the Toronto art scene, first gained access to Ontario Place last December, where he found the neglected innards of the park’s old Wilderness Adventure ride in disrepair. 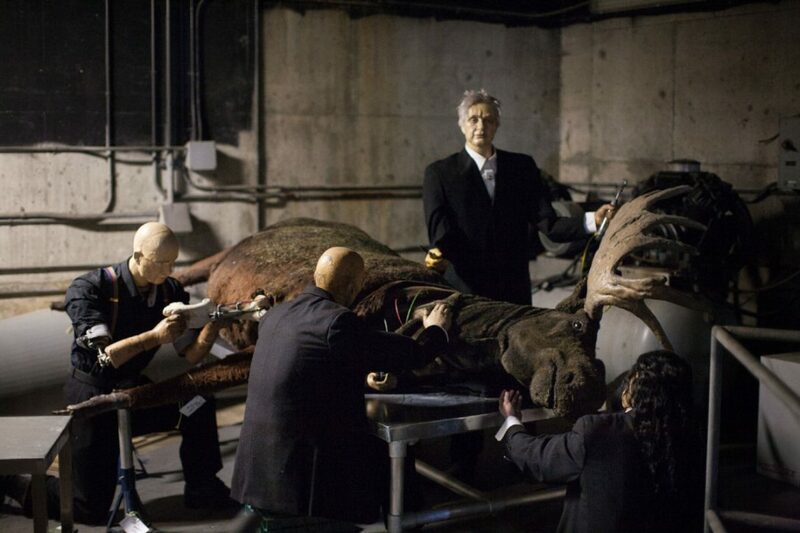 Faced with decrepit animatronic miners and moose, Dean hit upon a buyable fiction: abandoned by the crowds and the park’s masters both, the old mannequins decide to fix themselves up and adopt the abandoned grounds as their own. Tugging at the park’s artificiality, built to reveal some kind of Canadiana myth, has proven fertile territory for the artist; as the park crumbles, an outdated relic of a past time, the myth it perpetuated crumbles along with it. Ontario Place, it should be noted, had to be invented from the ground up. The island is the result of thousands of tons of landfill being dumped in the lake to make new ground. 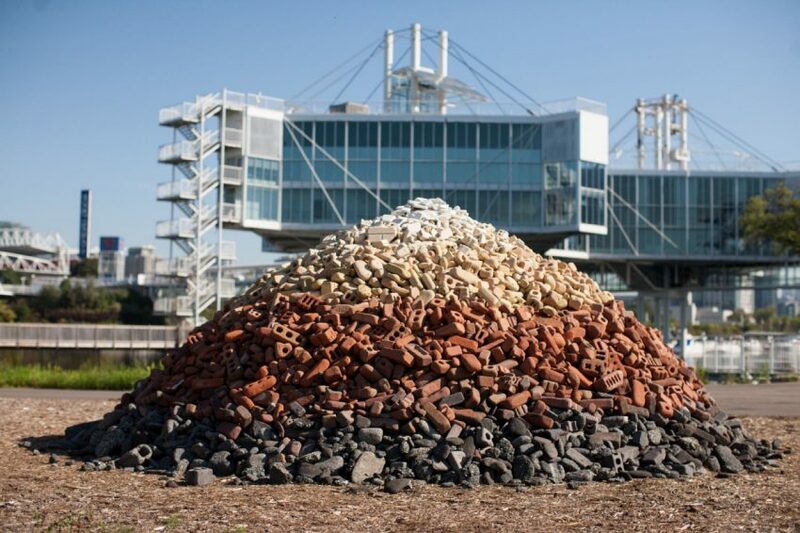 Watt-Meyer takes the idea on board, scavenging the Leslie Street Spit — more man-made land — for old bricks of varying shades to build Rubble Pile, which he finished from bricks plucked from the Ontario Place site itself. Things wash up along the south-side beach of Ontario Place, facing the open water as it does. Amid the debris — Coke bottles here, sadly; Doritos bags there — LeuWebb Projects has installed dozens of tiny plaster casts of the immediate surroundings: miniature geodesic Cinesphere domes, tiny Atlantises, clusters of wee multi-sided pavilions. 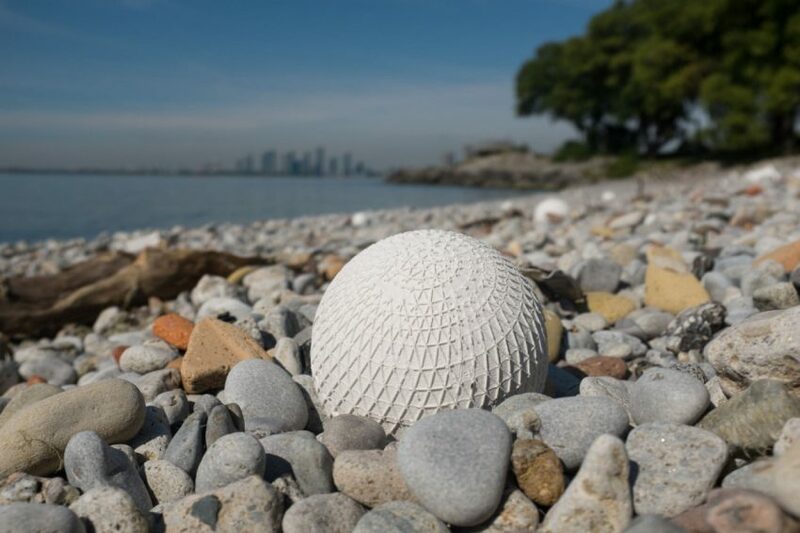 The obvious implication aside — Ontario Place: washed up — the piece does the work In/Future as a whole hopes to achieve: recasting the disused site from intractable problem to open question. In one of the weather silos perched high above the site (really: the park allowed visitors to experience simulated blizzards, fog and tornadoes, among other things) Lichty has used the interior height to brilliant advantage, stringing lengths of field tape — used to track your movements through the forest — in crisp lines. The notion, of a synthetic guide through the natural world, is a good one here, in the most man-made of environments trying desperately to appear real. 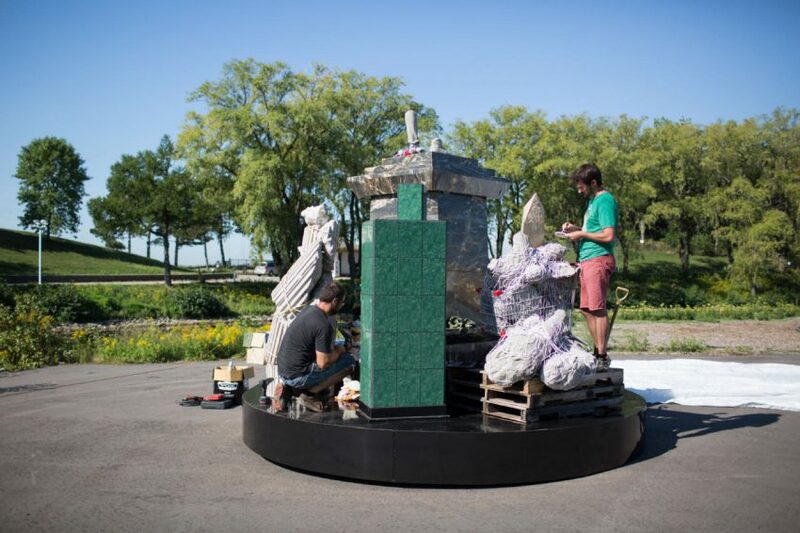 Acapulco, a three-person Quebec City collective, was invited this summer to make a public piece for the Contemporary Art Forum Kitchener and they hit on an idea: Who decides what makes a certain subject public-monument worthy, let alone durable? A century on, Acapulco’s Monument, with its agglomerated self-conscious kitsch and faux-marble core, won’t be terribly relevant, but that’s the point. Permanence, they seem to be saying, is insane hubris in a world subject to constant change — an apt metaphor, perhaps, for Ontario Place itself. Hengeveld, who has a history of building highly unnatural simulations of the natural world, embraces the Ontario Place theme here — amusement park, right? — with a roller-coaster version of the predator/prey relationship. In HOWL, a coyote chases a rabbit along a looping track, never getting closer —if it were caught, the amusement would end and the crowd would go home. Take it as a comment on humanity’s overarching need to control everything, natural or not; factor in you’re standing on a man-made island dominated by a fibreglass mountain surrounded by weather silos, and you get the point. One of the weather silos is occupied by Toronto’s Ed Pien, whose intricate cut-out work has morphed over the years into elaborate, immersive projection installations. 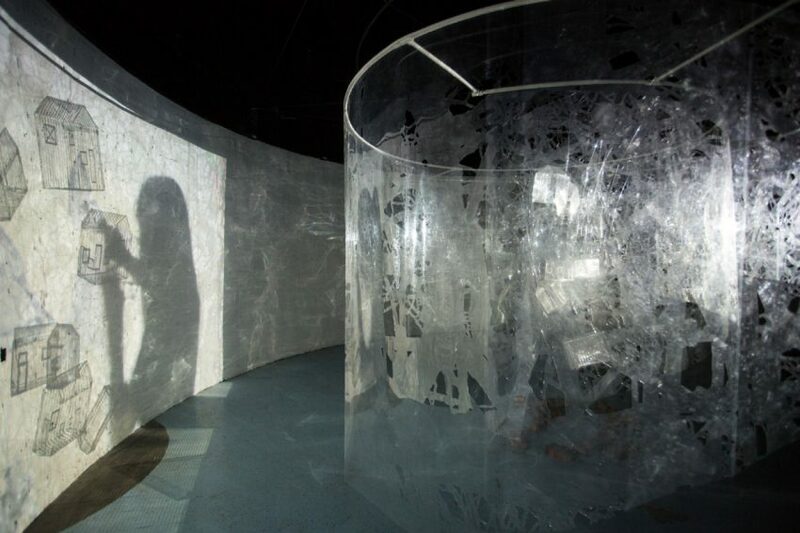 Here, Revel, a cool, shimmering environment, fits unnervingly well into the round space it occupies, casting tendrils of light on all sides of the main projection of a woman, in silhouette, tending to dangling structures. Installed in the silo where the tornado simulation took place in Ontario Place’s old “world of weather” days, Nicol’s piece is peaceful, eerie and mercifully gust-free. Lie on the floor and gaze upward at the diaphanous, glowing fabric structure above that resembles nothing so much as an outsize jellyfish, and listen: a little girl struggles to recite the informational panels of the old Ontario Place attraction, suggesting both the futility the park had in its dying days to connect to its nominal audience — families, who had decamped for Canada’s Wonderland — and a glimpse maybe of a possible future, where the no-nonsense educational mandate is leavened with a dose of the uncanny and the sublime. In/Future opens Sept. 15 and runs to Sept. 25 at Ontario Place.